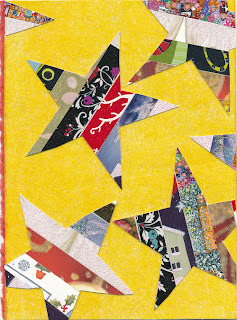 This colorful and oversized poscard arrived from Creativity Explored. 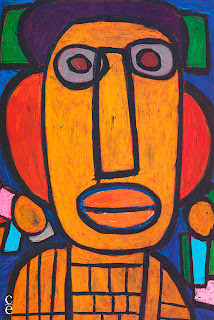 Vincent Jackson, one of the artists at the center, will have a solo show in January. 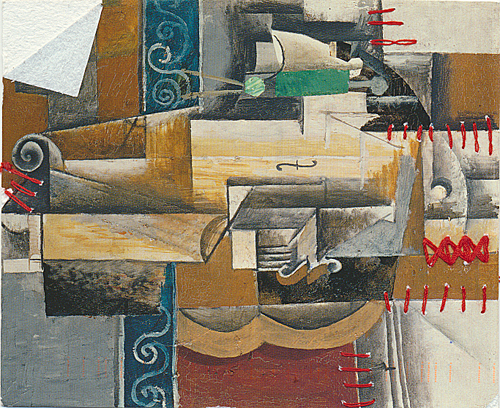 A card from a Russian postcrosser, cut smaller than regular size, and decorated with sewn red thread. 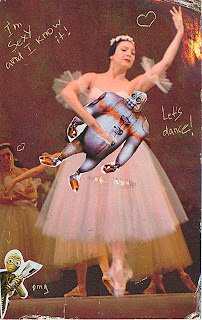 This amazing card arrived from a postcrosser in Belarus. 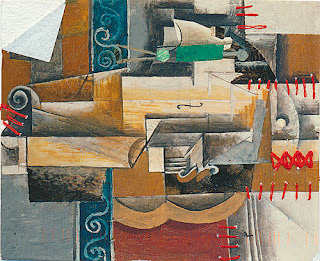 It is a testament to the fact that altered cards, no matter how funky, can travel safely from one country to the next. 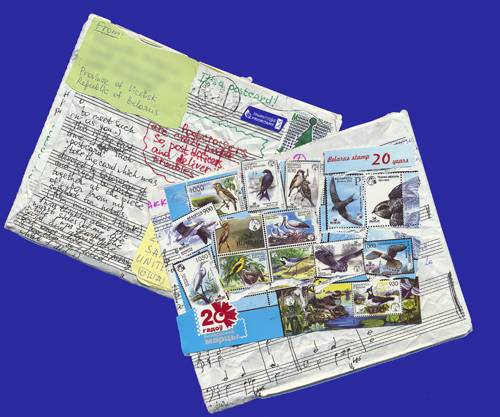 She tore apart a card of Belarusian stamps and pieced it together on her musical notes. She said the experience made her think of the worst sides of her life and the best. 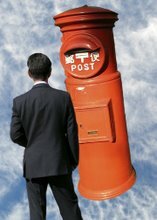 The back of the card had a note in red to the post officers to deliver without any troubles. Deliver they did, to my absolute delight. And this is my favorite card today. This Russian postcrosser dressed up the ballet card with collage that makes for a wonderful nutcracker scene. 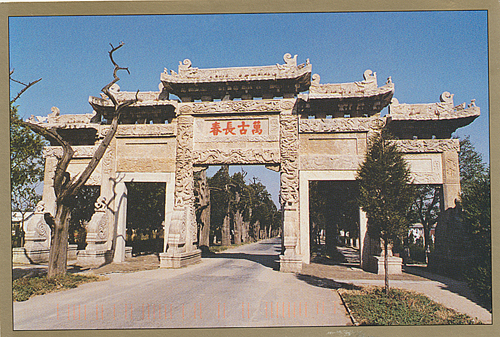 The ornate gates leading to Confucius' tomb. 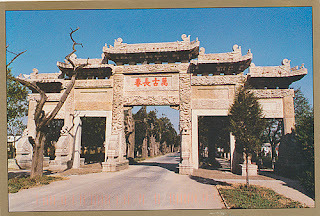 Note the dead tree on the left. 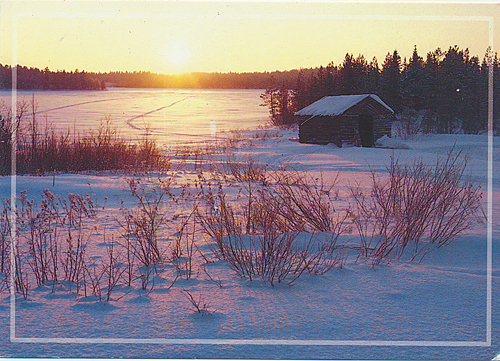 A lovely winter card from a Finnish postcrosser. She wrote down the typical foods eaten by a Finn: milk products, rye bread, Karelian pasty, Karelian hotpot, reindeer saute, meatballs, smoked fish, rice pudding, rye pudding, squeaky cheese, minced meat, cinnamon bun. Yum! Will have to look up recipes. Noticeably absent: any mention of fruits or vegetables. 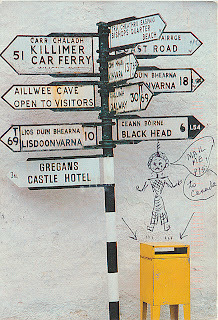 A Canadian postcrosser sent this card with a note that said that her late husband purchased the card from his birthplace in Ireland. She lives in northern British Columbia surrounded by nature. 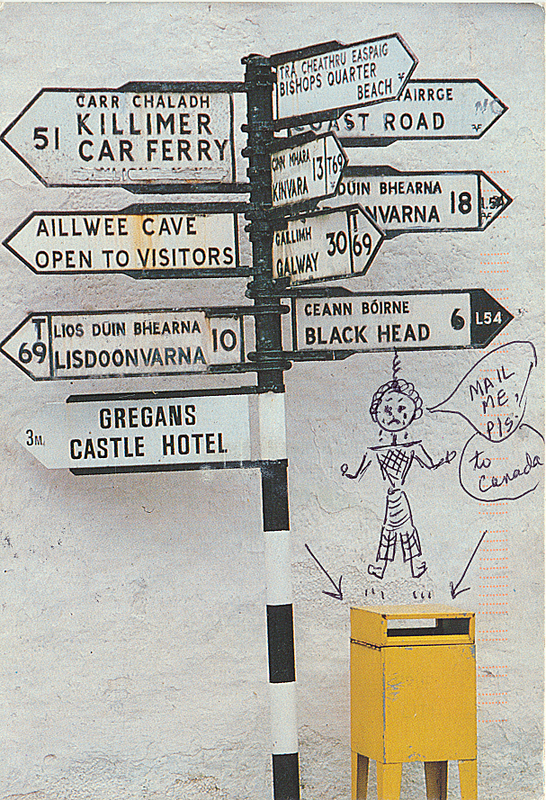 I love the little yellow mailbox, over which she's drawn herself, waiting for her postcard! Top card made by Gloria and Cynthia; bottom card made by Riko. 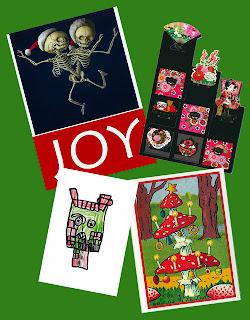 I had to resort to sending store-bought cards this year for the first time in many years. 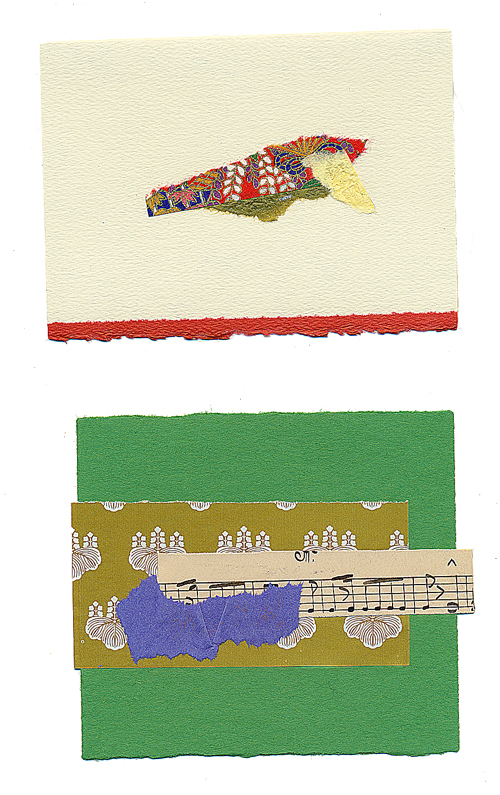 These cards are reminders that in 2014, I can go back to the pleasure of mail art. This has been a Christmas of lowered expectations because of my current workload. Still, I received some lovely cards from friends and family. 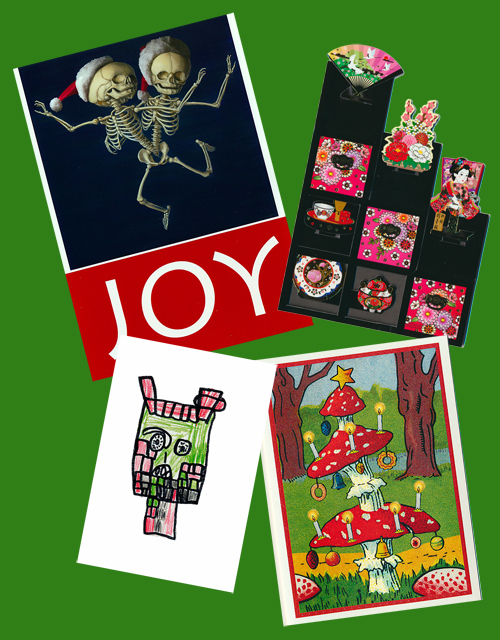 Clockwise from top left: artist S. Yagi's co-joined twins, brother Eugene's shape card from Japan, artist S. Cornett's mushrooms (my favorite European theme! 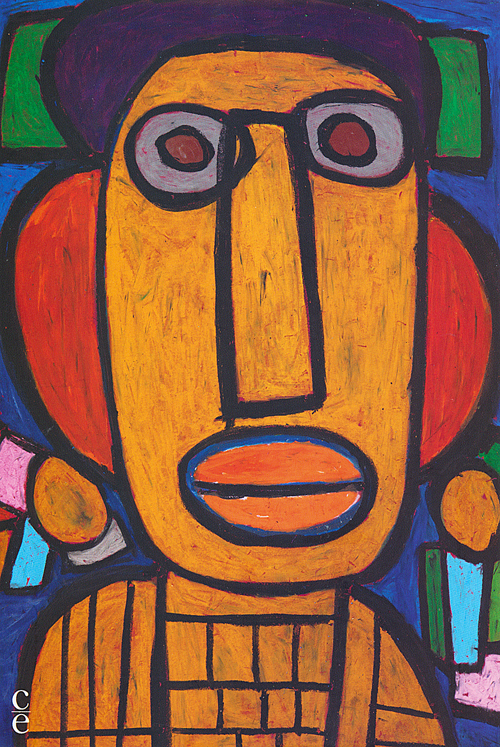 ), and an Artspan card of a drawing by a child from the Bessie Carmichael School. 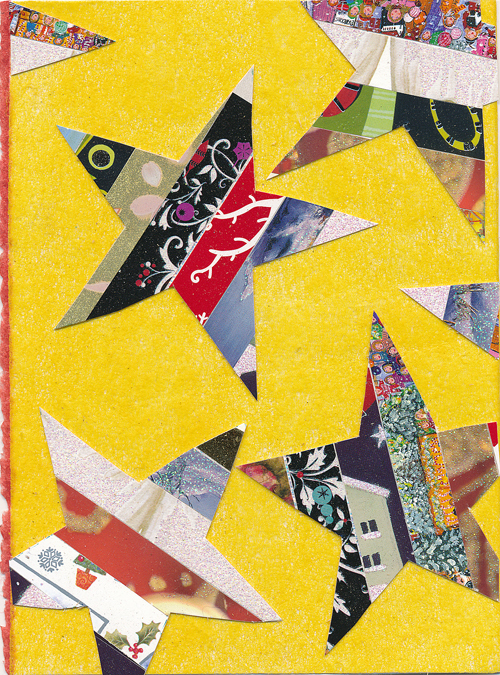 My friend Susan made this gorgeous card of stars pieced with old Christmas cards. This is the first year that I've foregone making cards for the Holidays and this lovely gift will be a reminder that in two years I will be free again to create. I received this lovely card announcing the Cape Dorset annual print collection. My husband and I started collecting Inuit art in the 1980's, when we went to Quebec City. In San Francisco, there's a shop called Images of the North that carries a nice collection of Inuit work, from lithographs to sculpture to jewelry. 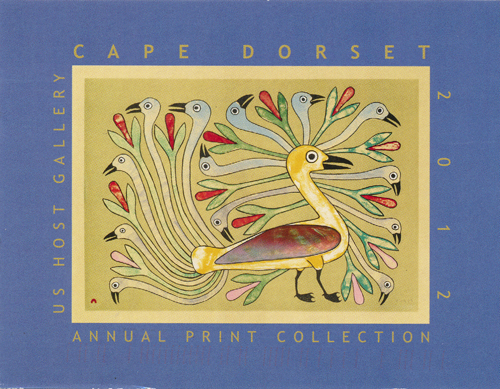 It's a dream of mine to visit Cape Dorset, but right now I'm content to receive a card filled with squawking geese. I was looking forward to this gorgeous sheet all year. 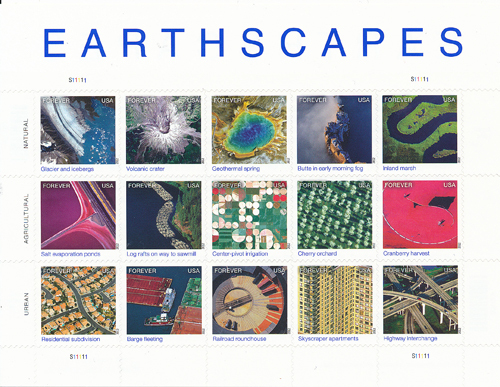 It reminds me of the Cloudscape stamps from years ago, but instead of looking up, these sheets look down. 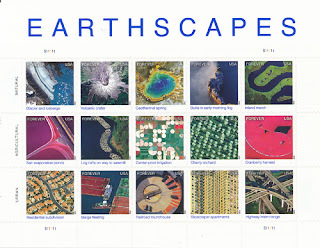 When I have a moment, I think I will create a set of cityscape artistamps in response to these earthscapes.